Posted May 26, 2014 & filed under Blog, Flood Mitigation. 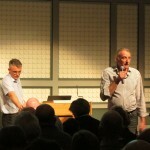 We appreciated such a huge turnout, particularly during Easter holiday time. Thank you also to those who sent apologies. To you all and those who couldn’t attend, this is a resume of the meeting. Also included are updates of progress since that evening. 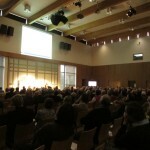 You can also view a video and photos of the event. Visitors in the Heart Space, Minster School. what action has been taken since our last public meeting in The Minster in September the next steps towards mitigation measures. 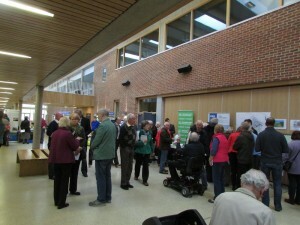 We welcomed nearly 400 people which demonstrates the strength of community interest in the aim to reduce flood risk. 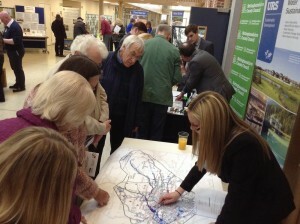 Members of the audience, more than half of whom had been affected by the floods and some of whom (a total of about 8 in the town) are still not back in their houses, asked a wide range of questions about planning options, funding availability and when a mitigation scheme was likely to be implemented. 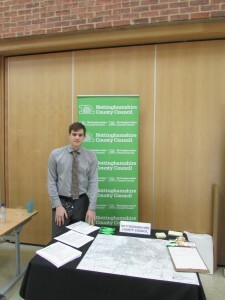 Representatives from DEFRA, NCC, NSDC, Southwell Town Council and the Forum responded. Flood consultants URS presented a preliminary first draft of the computer model which showed how the town flooded in July 2013 and which areas were impacted. They welcomed your comments on the model, which was produced using 3 different types of software to take into account topography, base water levels in watercourses and surface water run-off. 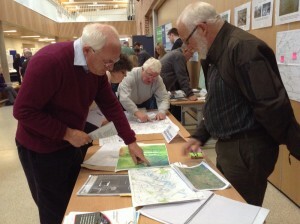 During the evening many people contributed further information about what happened and suggested mitigation measures. 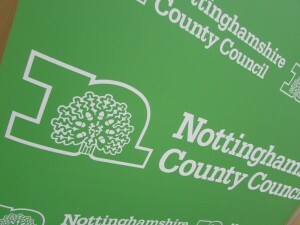 Hannah O’Callaghan, Flood Risk Management Officer, of Nottinghamshire County Council, which has the lead responsibility for flood protection, put in a bid for Grant-in-Aid (money coming from central government for a specific project) for £1.85m to fund mitigation measures. The Flood Model wasn’t finalised in time for this bid, but we had to submit our bid in March in order to get ‘a marker’ in for the 6 year cycle of Government funding. Our bid can be amended as more information on mitigation measures from the Flood Model becomes available. Hannah has since been promoted to a position with Warwickshire County Council and we are looking forward to working with her successors. 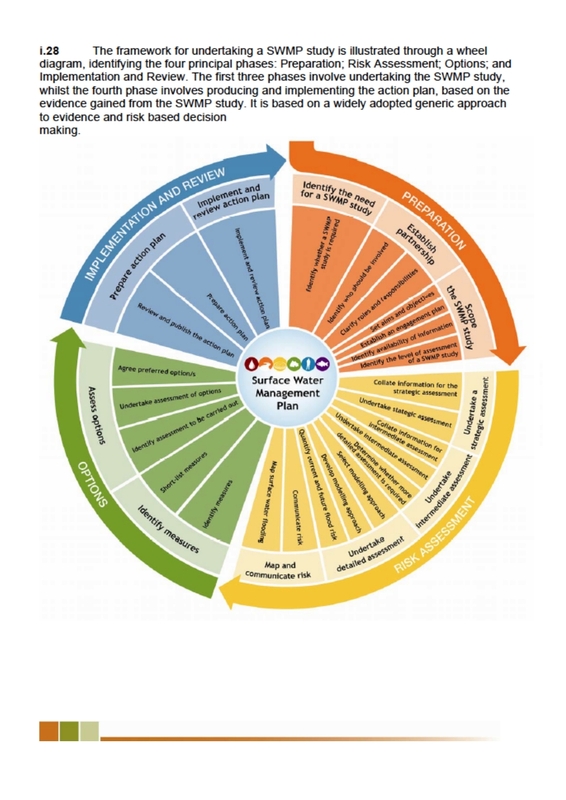 The Flood Study is being carried out using the guidelines and processes in the Surface Water Management Plan. As you can see from the process wheel below, we were halfway through the process by April 10th – but not halfway in terms of time. We have made rapid progress in a short space of time, but we will now have to be patient for that process and implementation to be complete. Tim Farr, appointed by The Department for Environment, Food and Rural Affairs (DEFRA) as the Chair of the Trent Regional Flood And Coastal Committee (TRFCC) said that while the ability to protect a large number of properties would be the key factor in securing funding, the local community’s willingness to raise money and take action itself would influence the decision. If approved, it is estimated that the measures proposed would come ‘onstream’ in 2017/18. This may seem a long way ahead and understandably many people were concerned about this timescale. The G-in-A process is a lengthy one as explained by Tim, Hannah and Steve Calvert Vice-Chair of Nottinghamshire County Council’s Transport and Highways Committee who is also on the TRFCC. We are now in the Options stage. 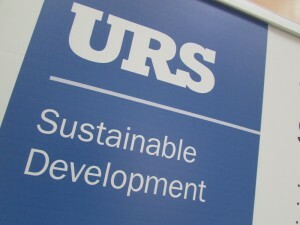 There was a meeting at URS offices with Forum members on Tuesday 13th May to verify the Flood Model. 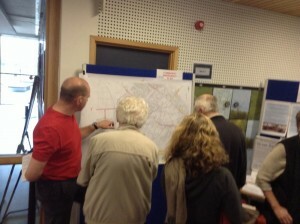 Ideas which had been suggested at the community meeting were added to a long list of potential options which had already been suggested by the community and the Forum Alleviation team. 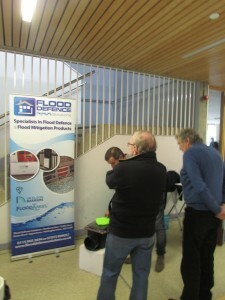 Short-listed solutions are being tested through the Flood Model in the next couple of weeks. While G-in-A will hopefully fund about £750K, there is a shortfall which needs to be met through partnership funding. 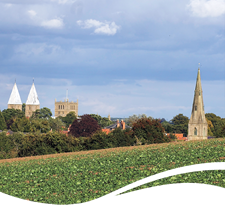 We are delighted that Southwell Town Council has already committed £40,000, raising this by increasing its precept element of the Council Tax by 39%. Depending on circumstances, this may continue for another 2 years. NCC and NSDC will be making commensurate contributions – we are awaiting news of the actual amounts. Forum Fundraising volunteers are working hard on the campaign to raise a community contribution of £125,000 – equivalent to roughly £50 a household – towards the mitigation measures. We encourage you to participate in helping in whatever way you can – through direct donations attending events, organising events etc. See bottom of newsletter for further details. You may have heard about the Government’s decision to pay up to £5k per property to communities hit by winter floods. Councillor Steve Calvert has written a letter of protest to Secretary of State for Communities, Eric Pickles, asserting that this doesn’t benefit communities, such as Southwell, affected by last summer’s flooding,. 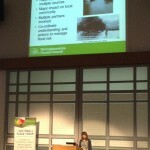 The National Flood Forum are also campaigning on this issue. Tim Farr emphasised that any grant for individual House Level Protection would come under the umbrella of the whole mitigation funding bid and urged caution on such applications from individuals. Rt Hon. Owen Paterson MP, Secretary of State for Environment, Food and Rural Affairs made two flying visits on 11th and 21st May, to hear about the work of the Flood Forum and problems we have in Southwell. The second visit was with both Co- chairs of the Forum and two members of Southwell’s business community. He is now fully aware of the devastation we suffered last year. He assured us that we were doing all the right things and was very impressed with the way our community has gathered such tremendous momentum. The Prime Minster, David Cameron, on his visit to Newark on 21st May stated that “We are looking very closely and very hard as to whether we should back-date the flood support schemes”. 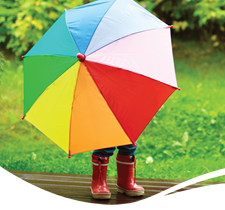 These are grants for personal property level protection similar to those offered to householders in the South affected by floods last winter. Many people expressed concern about development on at least two areas that are known to flood. Beckett’s Field on Nottingham Road and the old Minster School site on Church Street have planning permission but the Flood Risk Assessments have not yet been signed off. Matthew Norton of NSDC Planning Department said that, until the Flood Study is available, it made planning decisions difficult to refuse without validated evidence of flood risk. If they refuse planning permission on a ‘suspected’ flood risk situation and it goes to appeal, they lose the right to make further comments. 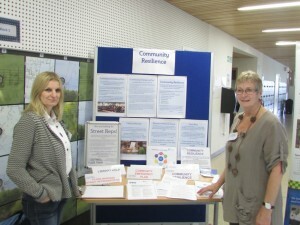 Community Resilience is key to ‘making the most’ of the local resources and knowledge within Southwell to aid well-being, promote growth and effective Flood Risk Management by being better prepared. 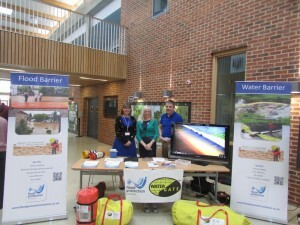 Some people have volunteered and received training in the roles of Flood Warden and Road Closure Warden. We are continuing to recruit and train further people to ensure we have a robust team to implement the Community Emergency Plan. Please do let us know if you are interested. Street Reps will play another important role in an ‘early warning’ system – keeping an eye on the weather, monitoring when a flooding situation may be developing and communicating with their neighbours. We are launching this ‘recruitment drive’ at an Open Evening, Wednesday 18th June from 7 to 9pm at Southwell Library. Lynn and Jacky showing information on the Library Help Desk, Education Resource Group, Street Reps.